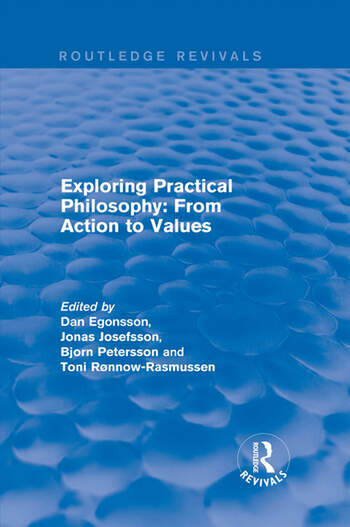 This title was first published in 28/11/2001: The broad label ’practical philosophy’ brings together such topics as ethics and metaethics as well as philosophy of law, society, art and religion. In practical philosophy, theory of value and action is basic, and woven into our understanding of all practical and ethical reasoning. New essays from leading international philosophers illustrate that substantial results in the subdisciplines of practical philosophy require insights into its core issues: the nature of actions, persons, values and reasons. This anthology is published in honour of Ingmar Persson on his fiftieth birthday. Contents: Acting, trying and rewiring, Paul Snowdon; Rationality and reasons, Derek Parfit; What to do about dead people, Fred Feldman; Genetic therapy and identity, Roger Crisp; Hume on himself, Galen Strawson; Worries about continuity, expected utility theory, and practical reasoning, Larry S. Temkin; The resentment argument, Michael Smith; Intrinsic value and individual worth, Michael J. Zimmerman; Prioritarianism and uncertainty: on the interpersonal addition theorem and the priority view, Wlodek Rabinowicz; Virtue ethics, TorbjÃ¶rn TÃ¤nnsjÃ¶; Fractal and fragile beauty, GÃ¶ran Hermerén.